Bounty follows Nina and Georgie, two bounty hunters who were formally at the top of their game as most-wanted criminals but had to virtually erase their existence in order to keep sensitive files out of the wrong hands. True to the sci-fi genre, issue 1 jumps right into the scene where they fall from the top. 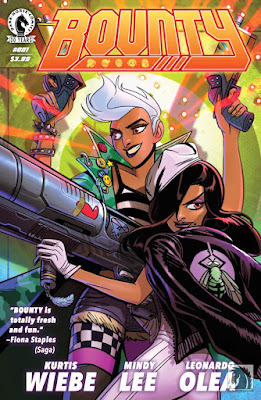 In Bounty we still get Wiebe’s sassy writing, a la Rat Queens, but it is now inclusive to wider range of readers. Mindy Lee does a beautiful job on the art and completely captures the feel of a futuristic space story. If you’re into cats and a fast-paced futuristic space ride or looking for a more approachable comic set in space (Descender and Southern Cross just didn’t do it for me, but this one definitely does! ), Bounty #1 is out tomorrow.